Let me say off the top that it’s about time that a TV show focused on the drama that plays out in a newsroom. It’s a place rife with strong story lines ripe for fleshing out. 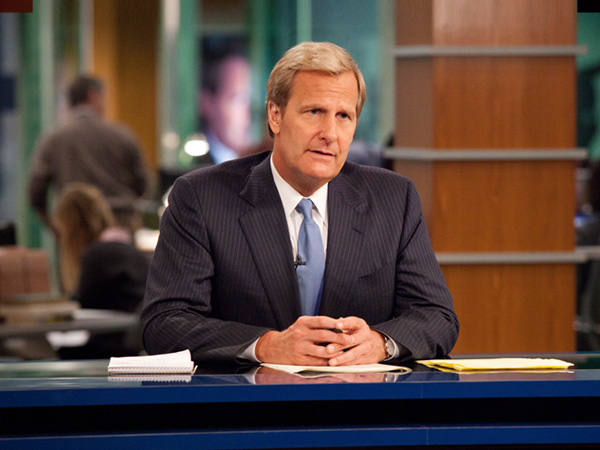 HBO’s The Newsroom, starring Dumb and Dumber’s Jeff Daniels as anchorman Will McAvoy, has been a polarizing topic among journalists since its premiere June 24. Carol Off, a host with CBC’s As It Happens calls the show “tedious and navel gazing,” while The New York Times wearies of the show’s preaching. The Newsroom has not been shy about harpooning the current media climate in the U.S., criticizing it for any perceived failure in its duty to report the news fairly, accurately and without hyped-up, ratings-grabbing sensationalism. Perhaps nowhere was that clearer than in McAvoy’s apology in the opening scene of episode No. 3 about his program News Night’s coverage. If we, as journalists are to do any navel gazing, this would be a good bit of dialogue to do it over. The full apology is after the bump. Good evening, I’m Will McAvoy; this is News Night and that was a clip of Richard Clark, former counter terrorism chief to President George W. Bush, testifying before Congress on March 24, 2004. Americans like that moment. I like that moment. Adults should hold themselves accountable for failure. And so tonight, I’m beginning this newscast by joining Mr. Clark and apologizing to the American people for our failure – the failure of this program during the time I’ve been in charge of it to successfully inform and educate the American electorate. Let me be clear that I don’t apologize on behalf of all broadcast journalists, nor do all broadcast journalists owe an apology. I speak for myself. I was an accomplice to a slow and repeated and unacknowledged and unamended train wreck of failures that have brought us to now. I’m a leader in an industry that miscalled election results, hyped up terror scares, ginned up controversy and failed to report on tectonic shifts in our country, from the collapse of the financial system to the truths about how strong we are to the dangers we actually face. I’m a leader in an industry that misdirected your attention with the dexterity of Harry Houdini, while sending hundreds of thousands of our bravest young men and women off to war without due diligence. The reason we failed isn’t a mystery – we took a dive for the ratings. In the infancy of mass communication, the Columbus and Magellan of broadcast journalism, William Paley and David Sarnoff, went down to Washington to cut a deal with Congress. Congress would allow the fledgling networks free use of taxpayer-owned airwaves in exchange for one public service. That public service would be one hour of airtime set aside every night for informational broadcasting, or what we now call the evening news. Congress, unable to anticipate the enormous capacity television would have to deliver consumers to advertisers, failed to include in its deal the one requirement that would have changed our national discourse immeasurably for the better – Congress forgot to add that under no circumstances could there be paid advertising during informational broadcasting. They forgot to say the taxpayers will give you the airwaves for free and for 23 hours a day, you should make a profit, but for one hour a night, you work for us. And that business was good to us. But News Night is quitting that business right now. It might come as a surprise to you that some of history’s greatest American journalists are working right now. Exceptional minds with years of experience and an unshakable devotion to reporting the news. But these voices are a small minority now and they don’t stand a chance against the circus when the circus comes to town. They’re over matched. I’m quitting the circus, switching teams. I’m going with the guys who are getting creamed. I’m moved. They still think they can win and I hope they can teach me a thing or two. From this moment on, we’ll be deciding what goes on our air and how it’s presented to you based on the simple truth that nothing is more important to a democracy than a well-informed electorate. We’ll endeavor to put information in a broader context because we know that very little news is born at the moment it comes across our wire. We’ll be the champion of facts and the mortal enemy of innuendo, speculation, hyperbole and nonsense. We’re not waiters in a restaurant, serving you the stories you asked for, just the way you like them prepared. Nor are we computers, dispensing only the facts because news is only useful in the context of humanity. I’ll make no effort to subdue my personal opinions. I will make every effort to expose you to informed opinions that are different from my own. You may ask who are we to make these decisions. We are MacKenzie McHale and myself. Ms. McHale is our executive producer. She marshals the resources of over 100 reporters, producers, analysts and technicians and her credentials are readily available. I’m News Night’s managing editor and make the final decision on everything seen and heard on this program. Who are we to make these decisions? We are the media elite.